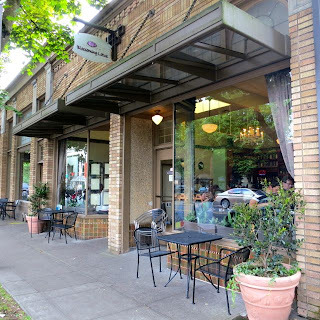 During my second visit to Portland, the restaurant at the top of my list to visit was Blossoming Lotus. 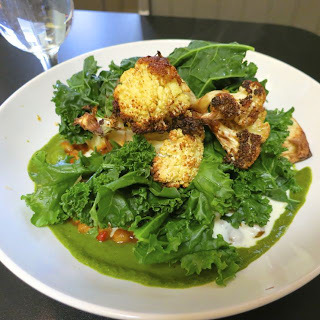 During my last visit to this restaurant three years ago, I was incredibly impressed with their raw organic options and was hoping to find the same on this trip. Blossoming Lotus is known as being the best vegan restaurant in Portland with an array of cooked and raw options. Because they don't take reservations for parties smaller than 5, we arrived at 5:30 p.m. on a Sunday hoping to beat the dinner rush. That plan didn't work. When we arrived, the restaurant was packed and there was a considerable wait. When you walk in you just write your name on a list and at some point, they call you to your table. There isn't anyone there to give you an idea of how long the wait is or anything, so you just wait. After about 20 minutes, I finally asked how long the wait would be and was told 20 minutes. Twenty minutes later, we were still waiting. Finally, after an hour, we were seated. That was slightly frustrating. The restaurant is very small with plain tan walls decorated with local artists' paintings, priced to sell. The dining room was adorned with a funky ceramic chandelier. I started by ordering Levitation's True Mystery. As mysterious as the name sounded, the drink was quite spectacular. 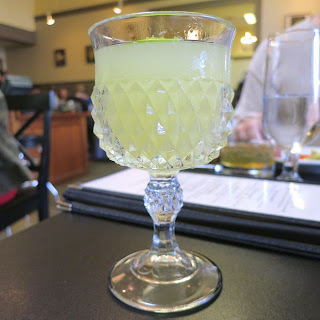 Made with Mezcal, Herradura Silver, Green Chartreuse, pineapply gomme syrup, lime juice, and Absinthe rinse, it was enough liquor to last the entire meal. 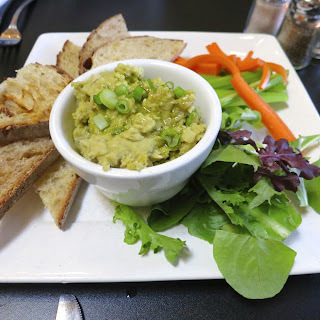 For appetizers, we ordered the Pesto & White Bean Dip as one of my friend is a huge fan of pesto. It was fantastic. We spread it on the toasted artisan bread and devoured it quicker than we could think about it. For my entree, I didn't find any of the raw dishes to be that exciting so I went with a cooked dish and I'm so glad I did. 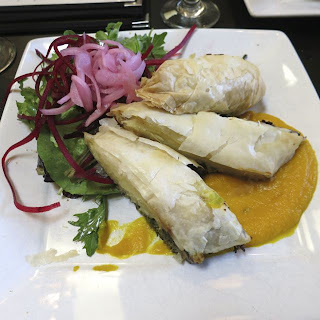 The Caribbean Phyllo Roulade was by far the best dish I had all week in Portland. We are talking sweet potato mash and jerk-spiced veggies wrapped in phyllo dough and served with carrot habanero sauce. As soon as I took a bite, I tasted the broccoli, then the sweet potatoes followed by the habanero sauce. The sauce wasn't quite as spicy as I would have liked so they brought out their housemade hot sauce, which was amazing. I inquired as to which brand it was only to find out it was made in house. I wanted to buy a bottle! On the side was a nice mixed greens salad dressed with pickled onion and hazelnut vinaigrette. 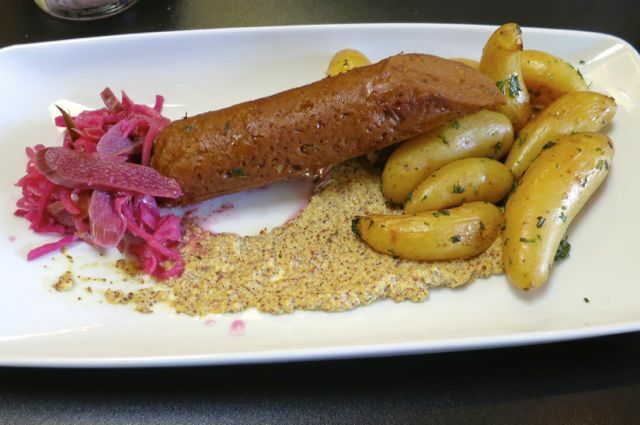 One of my friends tried an entree from the daily specials list -- Sausage with Potatoes and Kraut. Wow - this housemade sausage was meaty as could be and when paired with their housemade grain mustard, was as good as a vegan sausage dish can get. Despite our attempts at joking about his large sausage, he really enjoyed his meal. Another one of my friends ordered the Lasagna from the specials meal. 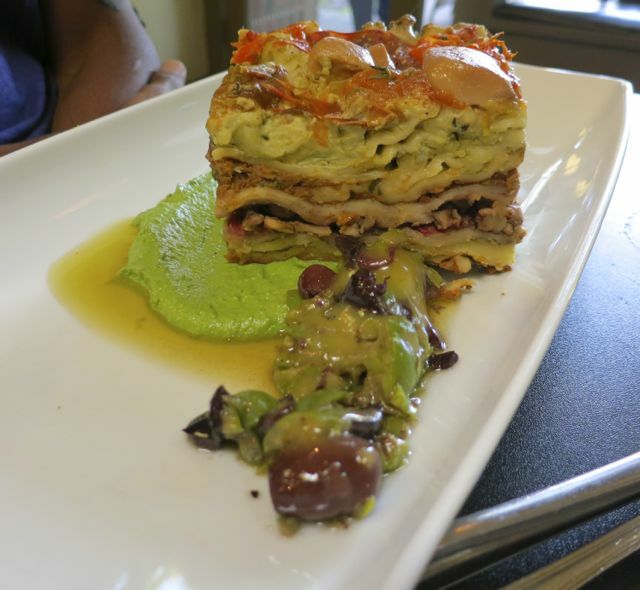 This was a large piece of multi-layered lasagna made with seitan bolognese, cashew basil cream, heirloom tomato, sorrel pesto, mushrooms, and olives. He raved about this dish all week. I thought it was pretty good as well. Lastly, another one of my friends ordered the Chana Masala. This wasn't your typical Chana Masala -- this was a gourmet take on that dish. Topped with seared cauliflower and steamed greens, the chickpeas really shined as they were coated in a spicy tomato ginger masala sauce with ginger crema and cilantro mint chutney. Impressive. For dessert, I ordered the lemon cheesecake along with a tawny port. 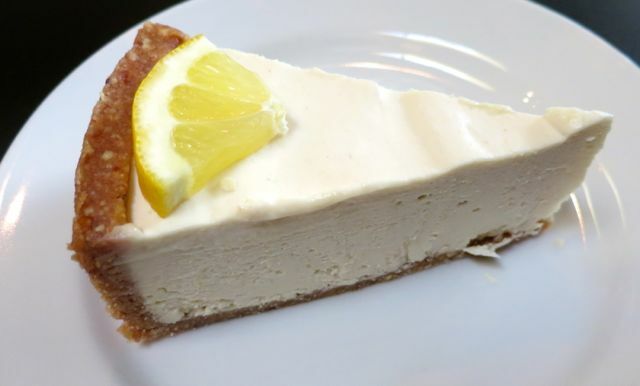 The cheesecake was as smooth as could be with a great nut-based crust. By the end of dinner, I was amazed that not only was every dish we tried very good, it was knock-your-socks-off good. We were all impressed with the level of complexity in each dish and the amazing mix of flavors. The entrees were priced at $14-$16, which was pretty cheap compared to other meals I've had of the same caliber. But, we were in Portland - the land of cheap eats. 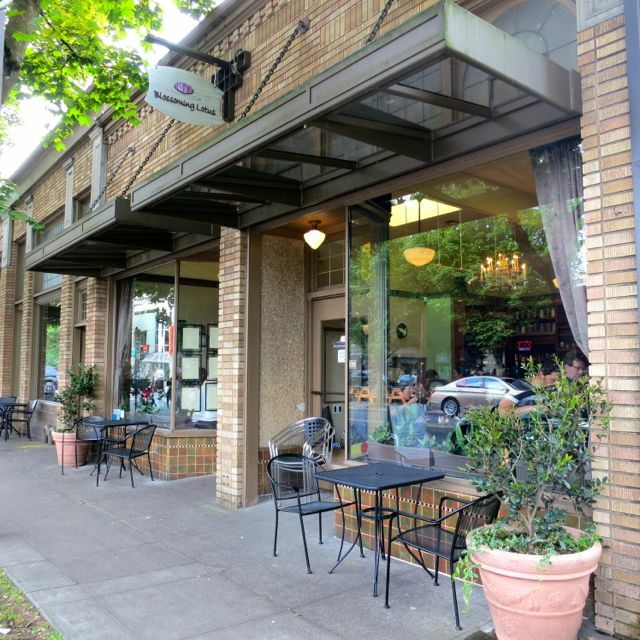 All in all, the service was good, the prices were great, and the food was fantastic. It is definitely worth the wait though it would be much better if they just took reservations. Highly recommended. Mmmm, Blossoming Lotus was so good when we went! I had some of the same dishes! That Caribbean Phyllo dish was bomb! Nice! I'm glad you got to try it too!